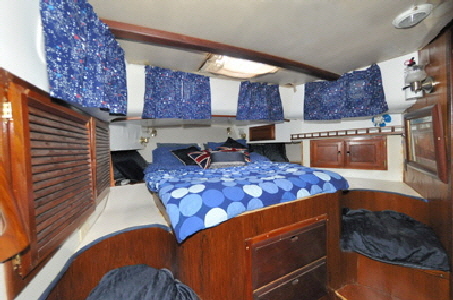 From the layout it can be seen the boat has a large aft cabin with an attached en-suite bathroom. Both are entered via a walkway down the side of the galley on the starboard side. This cabin is quite roomy, being ten feet six inches at its widest and nine feet deep. However the cabin was very strangely designed and built. The bed, which stretched the width of the cabin, was severely restricted by a full width deck storage lazarette half way down the bed with only fifteen inches of headroom under it. In addition, a small stainless wash basin had been built on the port side along with a bulkhead which stretched half way across the bed. This meant anyone sleeping on that side had to scramble over it all to get in and out of bed. This configuration mystified me. I have never seen an aft cabin and large bathroom, with the wash basin installed in the cabin, not the bathroom? 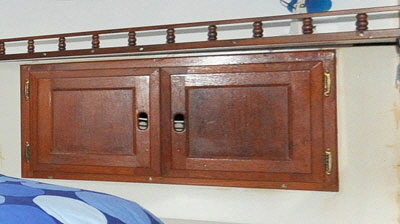 There were also small cupboards on either side under the lazarette. These were not a lot of use since they could only be reached by lying on the bed, and they couldn’t be opened when the bed was made either, because the doors were set too low. The accommodation had clearly been subordinated by the traditional concept of deck storage lazarettes. These were ‘glory holes,’ on every boat I have seen them, full of anything and everything. Mine included a propane gas tank lying on it’s side, which I considered highly dangerous, because if the tank leaked the gas would seep down into the cabin. Both hatches also leaked and the lockers were always swimming in water. I didn’t like the layout from day one, but I could see the potential for a very nice owner’s bedroom, with an attached bathroom and bath tub. It just needed remodeling. The obvious first action in remodeling this cabin was to make it possible for two people to actually sleep side by side in the bed, without having to climb over each other to get in and out. This meant removing those intrusive lazarettes, which turned out to be considerably easier said than done because the lockers were an integral part of the deck moulding. It entailed two full days of hard dusty sawing, hacking through multiple thicknesses of plywood and glassfibre with a powerful reciprocating saw, a couple of sharp chisels and a big hammer. 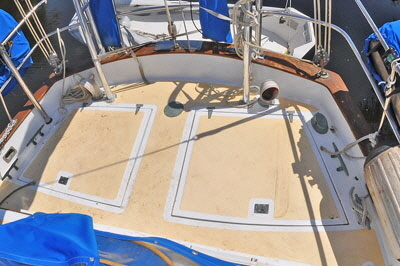 Then there were another couple of days trimming the rough cuts and permanently sealing the two deck hatches with glassfibre resin, which thankfully stopped the leaks. The area was further opened-up by removing the useless little cupboards either side at the foot of the bed. When everything was finally removed it had the effect of considerably enlarging the cabin. I then dismantled the silly little ‘unstainless’ wash basin, along with its cupboard stand and large half bulkhead. Then I cut away the bathroom door, complete with its framework and bulkhead and repositioned it at an angle, so a wash basin could later be installed inside the bathroom area, like any normal bathroom. I couldn’t do anything about the rudder post and steering quadrant, along with its hydraulic autopilot ram, which were directly beneath the bed boards, Because of this equipment the bed was three feet higher than the cabin sole, which made it difficult to climb in and out at the best of times. I solved this by tapering the foot of my new bed framework, which allowed enough room for a bucket seat to be built each side of the bed. This doubled as a step, making it very easy to get in and out of bed. The actual bed now measures six feet wide at the head, (king size), four feet wide at the foot, and over six feet long. The old bed foam had lost its support and even when supplemented with an extra two inches of new foam it was still horrible to sleep on. I personally like a soft bed, but my wife likes firmer support, so I overcame this dissimilarity by installing two commercial air mattresses, like used in hospitals. Unlike foam they are non-absorptive; light weight; easy to deflate and remove when necessary and fully adjustable for firmness. They are two feet wide, six feet long and five inches thick and kept in place against the tapered sides of the bed framework and in the center with a strip of foam. 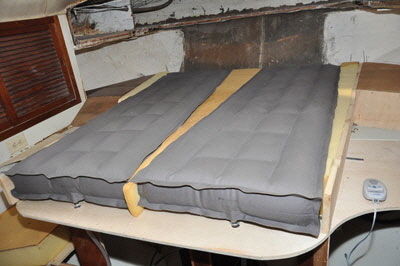 The mattresses can be inflated and deflated independently with a compressor which came with the mattresses. This has twin control buttons to adjust individual firmness. The compressor is 120 volts, which obviously works when on shore power, but also at sea from our inverter. It uses very little current, because we hardly ever adjust the pressure. My wife and I agree, this is now one of the most comfortable beds we have ever slept on, anywhere—on land or sea. Next I built the curved seats each side of the bed, using three laminations of 1/6 inch plywood which was easy to bend round to form the seat backs. I reused the old cupboard doors, to make new lockers which now actually open properly. I also made shelves and edged them with traditional teak pinrails. The bedroom had a bank of five large drawers built into the rear of the engine room, which I would not normally have touched. 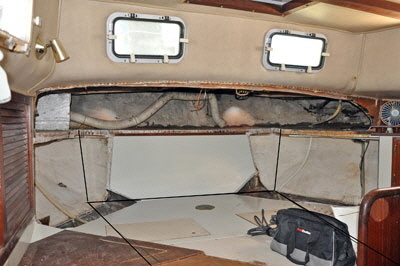 However, I needed a space to install an air conditioner unit for the aft part of the boat. Removing two of these drawers gave me the ideal space and rather than loose them, I incorporated them into the space below the bed. It’s quite marvelous what space can be utilized on boats with a bit of ingenuity. In this case I had actually gained three square feet to install the AC unit. 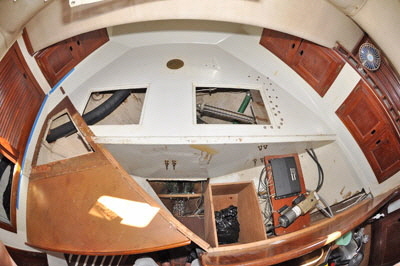 With the removal of the lazarettes the rear of the transom was exposed. I covered this with a sheet of plywood covered with vinyl foam and ran electrics for reading lights and sconce lights, working on both 120 and 12 volts. A ceiling was also needed where the lazarettes had been. I used EverTrue PVC Interior waincot panels from Lowe’s Hardware. These are seven and a half inches wide by eight feet long tongued and grooved plastic panels. They lock together and are easy to screw to the underside of where the lazarette had been. I trimmed the exposed edge with teak. The original foam backed vinyl cabin sides had become torn during the dismantling work, so I made cardboard templates and replaced them with Plas-Tex pliable plastic sheet. It was just glued to the side of the boat with contact adhesive. 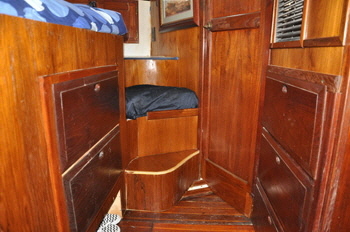 On the port side I incorporated a locker with a cupboard door to house fifty foot of chain and rope for a stern anchor. My wife sewed drapes for the four portholes, adding a nice touch of homeliness to the cabin. 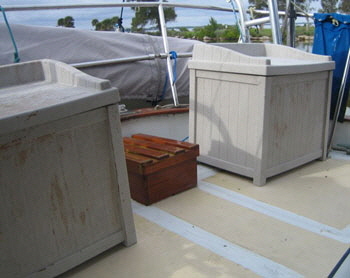 In this rebuild I used a lot of wood left over from other areas of the boat, which I had previously modified. In fact, most of one cabin still resembles a veritable teak wood yard. However, it was not always possible to match all the teak-faced plywood and the exposed ends. I therefore bought a four foot by eight foot sheet of teak veneer and laminated all the exposed edges and the curved seats. shipped. The veneer easily cuts with scissors and is best glued in place with contact adhesive, but you have to be very careful to place it correctly the first time. There is not much opportunity for adjustment, especially on larger sections After one coat of clear satin varnish the result is a very pleasing uniform appearance to the whole room. This cabin is what I now call a “stateroom” with space to move and dress, and somewhere to sit if you need a bit of peace. Of course, there was a loss of deck storage after removal of the lazarettes, including where to put the propane gas tank. I found two plastic deck (patio) seat boxes which I fastened to the deck and cut the base out of one to carry the gas bottle in an upright position. Most importantly, the tank is now completely separate from the cabin and any leakage vents into the atmosphere. The capacity of these boxes are only a little less than the lazarettes, and they also make nice stern deck seats. I am now looking for a couple of transom windows to mount in the stern.